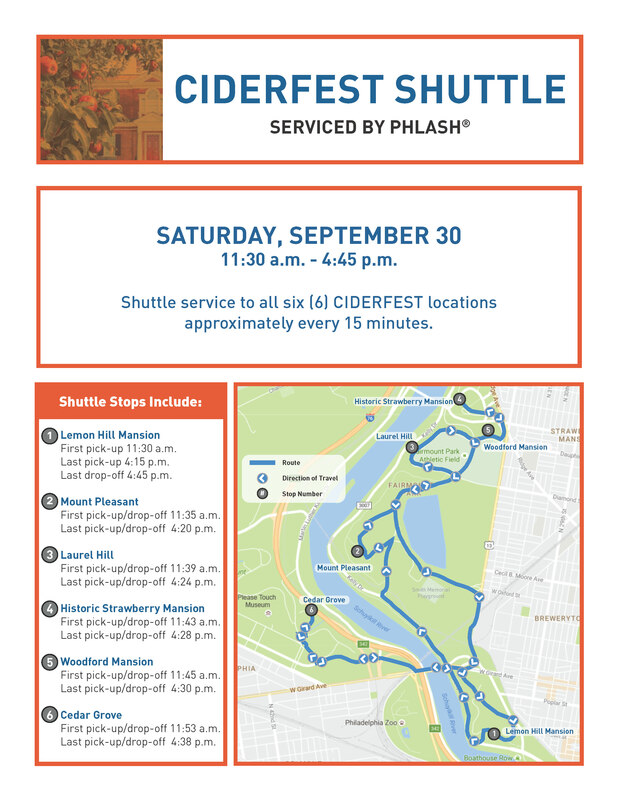 Spend a sparkling autumn afternoon on the grounds of six historic houses in Fairmount Park sipping on cider samples from some of the best cideries around. Enjoy live music and pay as you go food trucks to complement your tastings. Check out a sneak preview of the program for the day here (subject to change). GET TICKETS! The good feeling that comes with supporting ongoing programs and projects at Fairmount Park's Historic Houses! Tickets are $40 in advance and $50 on the day of the event (if available). This event is rain or shine. Limited free parking available at each historic house. RSVP on Facebook here. On the ticket page, select the historic house where you would like to start your day. This event is for visitors aged 21 and over only. ID required. For more information on the historic houses please check the Park Charms website. The Historic Houses of Fairmount Park are some of the best-preserved examples of 18th and 19th century early American architecture, all located in one of the country’s most beautiful urban parks. Promotion and programming for the historic houses are supported through a partnership between the City of Philadelphia Parks and Recreation Department, Fairmount Park Conservancy and various stewardship groups. Proceeds from this event supports the ongoing stewardship, maintenance and promotion of these treasures. For ages 21 and over only. ID required. Event is rain or shine. Outdoor tenting will be provided. In case of extreme weather, buyers will be notified of a cancellation at least 24 hours before publicized start of the event.